EXO is coming back to Singapore with their third Concert Tour EXO PLANET #3 – The EXOrDIUM this 2nd of April! This tour marks the groups third solo concert tour since their debut in 2012. EXO set new record in South Korea by being the first KPOP group in history to hold “all sold-out six days” concert at Seoul Olympic Gymnastics Arena, amassing over 84,000 fans of them. Debuted in 2012, EXO rose to fame with their first original album [XOXO] which also became the first album to sell over one million copies in Korean music industry in twelve years. EXO was recently awarded Best Album of the Year by Mnet Asian Music Award 2016 with their latest album EX’act which also is their third consecutive album to have sold over 1 million copies, setting a triple million seller record. EXO set and break records internationally earning them a position as the most influential celebrity by Forbes Korea. EXO PLANET #3 – The EXOrDIUM –, was opened in Seoul and they have since toured in many cities including Bangkok, Fukuoka, Sapporo, Tokyo, Osaka, Hang Zhou and Taipei. In this close to three-hour show, EXO is set to perform hit titles like Growl, Wolf, Overdose, as well as Monster & Lotto from their latest albums. The EXO’rDIUM will be one of the biggest concert of the year with an extraordinary production including spectacular stage with fantastic lightings and visual effects. This concert is definitely one that must not to be missed in 2017! 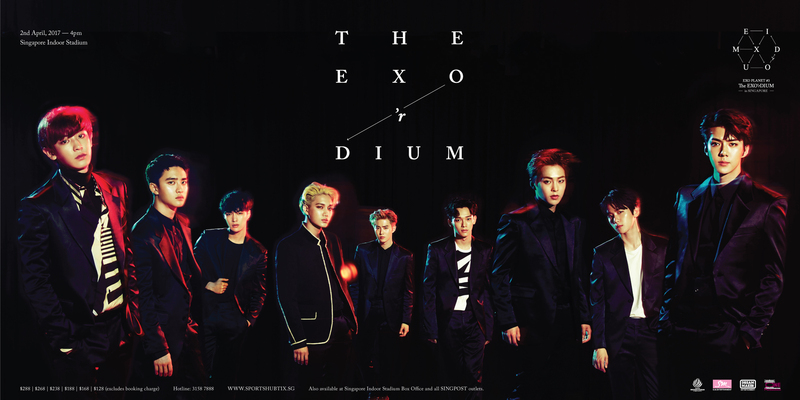 EXO PLANET #3 – The EXOrDIUM – in SINGAPORE is promoted by ONE Production and organised by SM Entertainment and Dream Maker Entertainment. Tickets are priced from $128 and will go on sale from 21st Jan, 10AM through Sports Hub Tix. Tickets also available at Singapore Indoor Stadium Box office and all SINGPOST outlets.